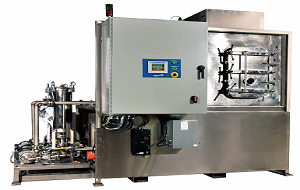 The Sharpertek MFST Cleaning machine is a drop-loading, single tank, industrial parts washer designed to a standard basket of parts at a time. ( Special sized baskets can be utilized.) It is ideal for washing a wide variety of parts such as Aerospace, Bearing, Screw Machined, Machined Casting, and other Precision Components in a lean, cellular operation. The heat, ultrasonic action, and chemistry effectively remove oils, soils, dirt, chips and other by-products associated with manufacturing from ID and OD areas. At a cycle rate of up to 2 baskets per hour, the production rate is up to 16 cubic feet of parts per hour. Cycle times are variable and dependent upon soils and parts. Actual time cycles will be confirmed when part testing is conducted at Sharpertek in a MFST system. 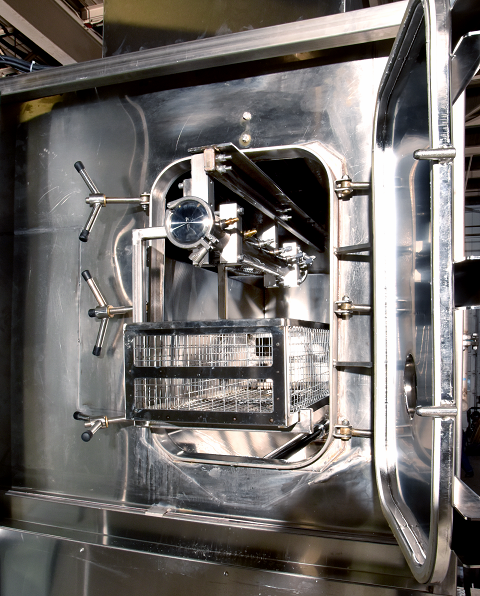 The MFST can process up to 5 baskets an hour. A key feature is the system’s ability to keep the baskets submerged while simultaneously cleaning with heated solution and ultrasonics. This results in the best possible cleaning of complex-shaped parts by penetrating blind holes and cavities. 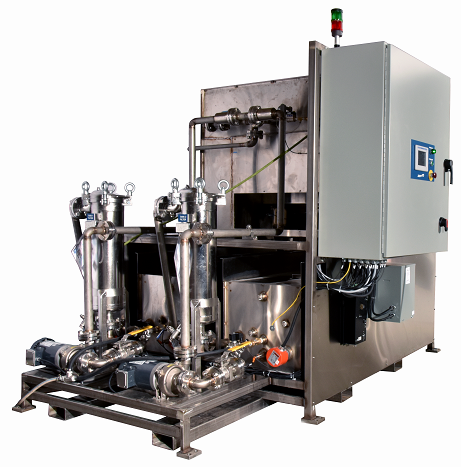 The delivery of filtered Solution fully purges the cleaning chamber more than twice per minute, flushing soils and chips from the parts and process chamber, allowing even the most complex parts with blind holes to be effectively cleaned. Years of Sharpertek innovation and development have resulted in proven, simple, and rugged design and construction elements that provide reliable operation. The solution is continually filtered through out the cleaning process. The entire volume of the cleaning chamber is turned over more than twice a minute. This fast recirculating turnover rate flushes away chips, soils and oils, always keeping fresh, clean solution in contact with the parts. Discharge solution is filtered during discharge process. Carbon filters are used to remove chemicals and oil that is dispersed in the solution. The cleaning chamber bottom is pitched from three sides for 100% quick drainage and chip removal. Chip strainer baskets are included for the tanks. All returning solution is filtered through these baskets to keep the storage tanks chip-free. Solution tanks do not have to be emptied to clean the baskets. To empty the chip baskets, the access door is opened and the baskets are taken out. An optional belt-type oil skimmer or recirculation oil coalesce can be added to the wash tank for oil removal. The MFST uses a fast and efficient drying system, resulting in faster cleaning cycles than competitive machines. The dryer incorporates Sharpertek's high volume and high velocity convection dryer which recirculates the air rather than discharging it into plant atmosphere. This system recirculates five times the air of competing systems, discharging the air flow through multiple slots aimed directly at into the tank. Over 95 percent of the air is re-circulated in the Sharpertek dryer, typically drying parts twice as fast while using lower air temperatures and half the energy of other systems.